So many things. Pulse diagnosis is one of the most nuanced and insightful skills that we have as TCM (Traditional Chinese Medicine) practitioners. It can confirm something that we may have been leaning towards in our diagnosis and it can also reveal different details that may have been overlooked. 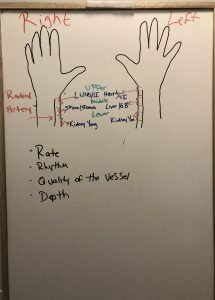 When we take the pulse, we are taking the radial pulse, which is the vessel just below the thumb. We feel for multiple things but first, we start by looking at; upper, middle and lower parts of the body. Right and left sides reveal different things. and lower. I won’t go into the details of Kidney Yin and Kidney Yang in this video. Superficial level – tells us what is happening at the Qi level. So, the surface of the body. Deeper level – tells us what is occurring at the organ level. This will tell us how deeply a pathology may be rooted and can also give us a sense, based on other mechanisms at play how long something may have been developing for. Then we have the qualities. There are too many qualities to mention so I’ll just give you an example. To begin, I should mention that I ONLY actively seek out 2 things on the pulse; the rate and the rhythm. Everything thing else I let come to me. So, I let the vessel make its impression on me and I go from there. What quality do I notice the most? What sticks out the most? In a general sense what we are looking for is what is the tone of the vessel. Is it super tight and does it feel like it needs to be relaxed? Is it too lax and feel like it needs to be tonified and nourished? Does it feel like blood is rushing through the vessel as fast as it possibly can or does it feel like it is limping along? All of these characteristics of the pulse will reveal something diagnostically. And this will give us an idea of where and what do we need to treat. So where might we want to release and relaxed flow or where do we want to bring flow to an area. We do this so that the Qi/life force and blood can circulate evenly and smoothly through the body because once it has this, it intuitively knows what to do and how to be in balance. Hopefully, that helps give you a basic understanding of what it is that the pulse can tell us in Acupuncture and Chinese Medicine. If you’d like to go deeper still check out my 6 week Chinese Medicine course.